Musical Wars in the Stars! 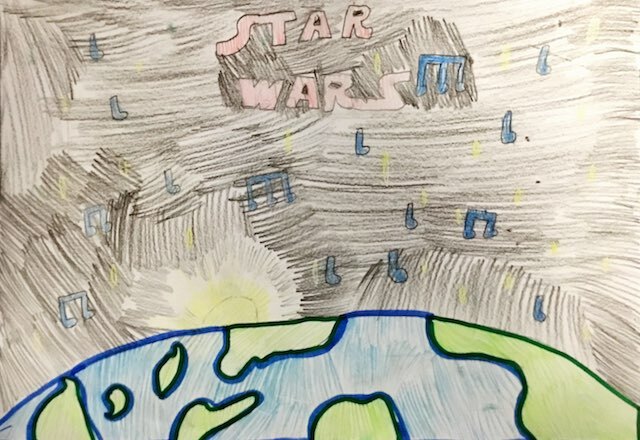 Artwork by children from Preston West Year 4 will be screened with the live playing of The Star Wars Epic. Some examples are shown above! This is a new work, commissioned by Preston Symphony Orchestra from Melbourne based composer, William Schmidt. The performance on the 31st March will be the world premiere! William has received many commissions for new works and a violin/piano composition has been released on a Move CD. He contributed to The Preston Suite, premiered by the orchestra last year. From Earth to the Galaxy offers a musical landscape where the smallest details come into focus. William has worked extensively as a composer, accompanist, solo and chamber pianist and music director. 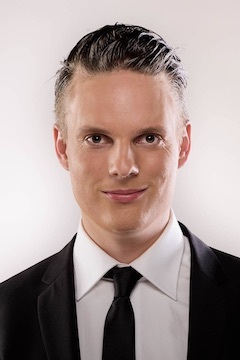 He completed a Master of Music Performance at the University of Melbourne and Master of Arts with distinction in piano performance at the Musik und Kunst Privatuniversität in Vienna. William regularly receives commissions for new works in a variety of media. His music has been played many times on both ABC Classic FM and 3MBS radio, with a large collection of his works broadcast on a 2017 two-hour episode of the 3MBS program “Illuminations”. William was the 2011 featured composer for the Camberwell Music Society concert series, and his violin/piano composition “Argentinian Etching” appears on the 2014 Move Records CD “The Sky is Melting”, performed by the Rothschild-Riddle Duo. This year he premiered his “Glory Vines Suite” for two pianos alongside internationally renowned pianist Elyane Laussade. 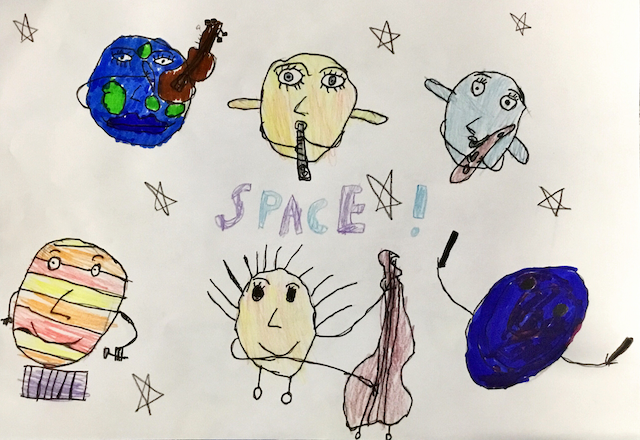 William’s works have won the Grainger Composition Prize, the Musical Society of Victoria’s David Henkels Award, and numerous other competitions. He has also received the Australian Music Foundation’s Inaugural Guy Parsons Award, the Australian National Piano Award’s Travelling Scholarship, first prizes in the Australian Youth Piano Recital and the National Pharmacies Piano Concerto Competition, various University of Melbourne scholarships and many other awards. Together with his compatriots Edward Elgar and Ralph Vaughan-Williams, English composer Gustav Holst wrote during a golden period of English symphonic music in the early decades of the twentieth century. Holst’s intellectual curiosity saw him set much folksong and poetry to music, and an interest in astrology led to his conception of a large orchestral suite based on the planets. 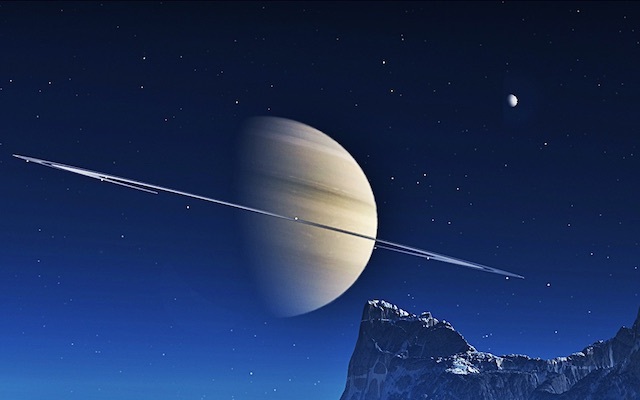 Composed over the years 1913-16, and premiered in 1919, The Planets quickly gained fame for its bold use of colour and rhythm. The apocalyptic ending to ‘Mars, the God of War’ seems to be a comment on the devastation of the Great War, though it was largely completed before that conflict began. Born at a time of growing nationalism throughout Europe, Czech composer Bedřich Smetana pioneered the development of a musical style that became closely identified with his country’s aspirations to independent statehood. Internationally he is best known for his opera The Bartered Bride and for the symphonic cycle Má Vlast (‘My Country’), which portrays the history, legends and landscape of the composer’s native country and contains the famous symphonic poem ‘Vltava’, celebrating the Vltava River that passes through Prague and the Czech heartland. Prolific American composer John Williams is best known for his many film scores, including Jaws, Indiana Jones, Harry Potter and of course, Star Wars. Williams’s neo-romantic style is hardly original, drawing on many exemplars including Wagner, Strauss and Korngold. But his melding of tone and colour with filmic content has been highly successful and enormously popular with audiences. Today’s suite shows evidence of Wagnerian leitmotiv style, with distinctive phrases evoking specific ideas and characters from the early Star Wars films.